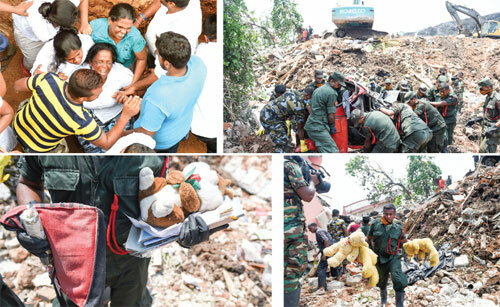 Victims of the Meethotamulla garbage dump collapse yesterday rejected government's offer of compensation in an amount of Rs 100,000 and an additional sum of Rs 2.5 million for construction of a new house. They have insisted that they will not budge from the site till such time as the government is prepared to provide them with the precise market value of the houses destroyed in addition to compensation for value of land lost in the tragedy. The residents of Meethotamulla charged that the modus operandi of the government was to get rid of them from their original home sites by offering them chicken feed for their damaged houses. "Though they are ready to give us Rs 5 million that does not do justice to the value of the houses that were here before the garbage collapse. No one can build a house for Rs 5 million in Colombo," the residents of Meethotamulla said. Attorney Nuwan Bopage, Convener of the Peoples Movement against the Kolonnawa Landfill, said the onus was now on the government to treat the Meethota-mulla garbage dump as a special case and find solutions to the situation. "The Meethotamulla landfill was one that was created solely for the purpose of politicians here. Now, by merely making a payment of Rs 100,000, these politicians cannot wash their hands off this tragic event. They need to go beyond the circulars and talk with the residents before providing the necessary compensation," said Bopage. He said the government must first hold discussions with the concerned residents before proceeding. Bopage charged that the government has not held any talks with the victims of the tragedy, to date. Most of the residents stated that their houses were registered under legal deeds of ownership. "Deeds were not issued to a small number of persons. However, we stress that we built these houses over a long period of time and with great difficulty. It is only we who know how much we've had to suffer in the process of building our homes there. We've even had to go without food on several occasions to raise the finance for building. That's why we demand the true market value for our destroyed homes," the residents said. A spokesman for the Sri Lanka Army said the garbage dump collapse had destroyed or party damaged up to 79 houses with 31 persons confirmed dead at the time of writing. Several residents of Dahampura said that as many as another 30 could still be buried under the garbage and debris of several houses. However, the Army says it could only be either five or six persons who could be still underneath the dump. The JO charged that though the total number of houses damaged by the catastrophe could be over 100 the government is concealing the truth.